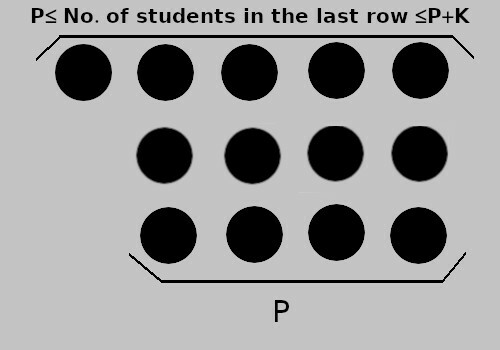 Every row except the last row contains exactly P students. The last row can fit anywhere between P and P+K students, both inclusive. All students must have height strictly lesser than all students standing in all the rows behind them. i.e Every student in the ith row must have a height strictly lesser than all students in (i+1)th row, (i+2)th row and so on. Note: If the arrangement consists of only one row, consider it as the last row and not the front ( i.e it should obey the conditions for last row). The first line of each testcase contains 3 space separated integers N, P and K.
The second line of each testcase contains N space separated integers, the heights of all students. For each tescase, output one word, either "YES" or "NO", based on the possibility of the arrangement.